Our time in the Lake District of Argentina had come to an end. The 10 day trip was filled with nature and outdoor activities, but it was time to move on. 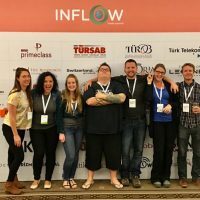 On one hand, we were looking forward to travelling from Bariloche to Buenos Aires, as it meant we would be flying to Istanbul to attend the Inflow Travel Summit. But on the other hand, this meant that our time in Argentina, and South America as a whole, would be coming to an end. It was a bitter-sweet bus ride. Me on our fantastic Andes Mar bus from Cafayate to Mendoza. Much nicer than the one Nick pointed out. I looked over at the bus Nick was pointing to and my heart dropped slightly. Trying to be positive, I boarded the bus and prepared myself for what I was about to see. As predicted, narrow, fabric chairs with hardly any leg room were what we’d be sitting (sleeping) on for the next 26 hours. The bus was fairly clean though, and there was an attendant serving up some tea and coffee and food as well. Maybe it wouldn’t be such a bad overnight trip after all. Around 11:00pm, we pulled into a city and were told we had to transfer buses. This was news to us, and changing transportation is never a good thing. In all of our travels, we’ve never changed buses to find that we’ve been upgraded to a better one! Boarding the second bus of the 26 hour journey, I couldn’t be positive anymore. The seats were awful. They barely even reclined and were very uncomfortable. The bus was dirty, with food and garbage in the aisles. As an added bonus, there was old gum stuck to our seats. There was no bus attendant which meant no water or anything to drink (we had a little bit of water left, thankfully), and to top it all off, the guy sitting behind me was extremely drunk, talking to himself and randomly yelling. I looked at Nick and we both grabbed our bags and moved up a few of rows to avoid the drunk sitting directly behind us. Of course, after an hour or so the bus stopped again and new passengers boarded. We were in someone’s seat and had to move back to our original ones. We told the bus driver we would move anywhere but our assigned seats, and luckily, there were two available. 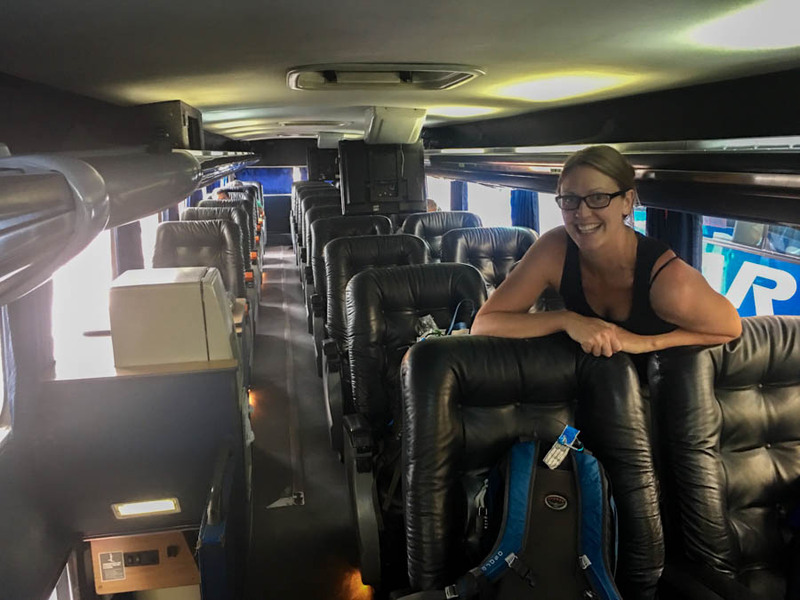 After 26 hours of sitting on a smelly, uncomfortable bus – which only stopped once to let us out to stretch – we finally reached Buenos Aires, and thankfully, everything got better once we arrived. 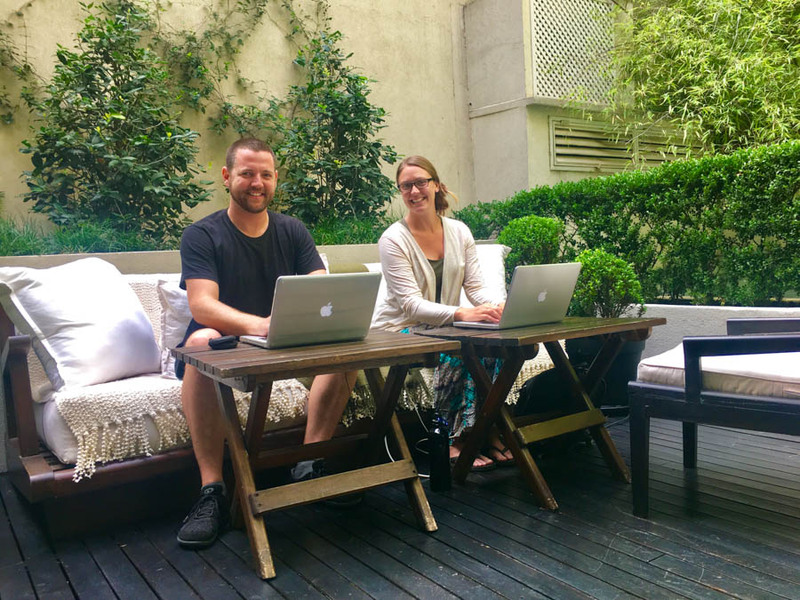 In December and January of this year, we lived in Buenos Aires for one month in an AirB&B apartment. There were some aspects of the city that we enjoyed, but for the most part, we had a love/hate relationship with BA and were looking forward to giving the autonomous city another chance. We hailed a taxi outside of the bus station and made our way to Serana Hotel in the Retiro Neighbourhood. 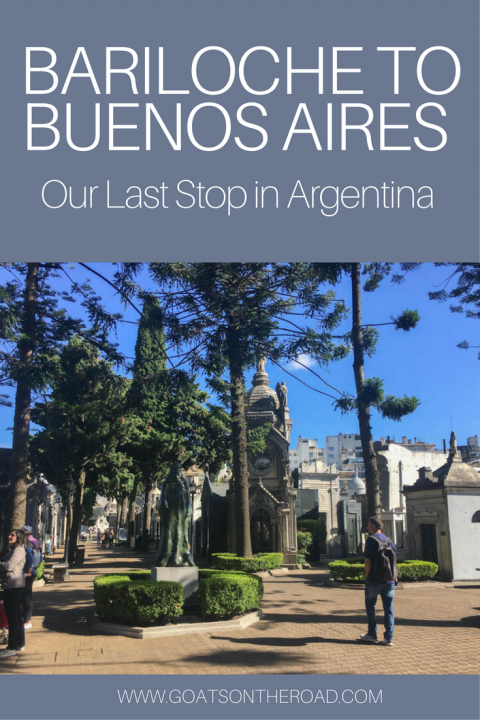 During our previous stay in BA, we were in the Villa Crespo neighbourhood, so this time around we were looking forward to exploring Retiro and Recoleta – two upscale, picturesque areas of the city. You have no idea how good it felt to flop down on the comfortable bed and be completely horizontal after such a horrendous bus journey! Needless to say, our first night back in the city was spent sleeping. It felt so good to be horizontal! The Recoleta Cemetery is home to 4,691 ornate mausoleums, including that of the famous actress and politician, Eva Perón. Even though we had been here before, it still impressed us and we couldn’t help but to take more photos and gawk at the intricately carved structures. We’ve never seen anything quite like it. Near to the Serena Hotel was a fabulous little restaurant serving up Argentine food, at very affordable prices. After not having a proper meal for almost two days, it was nice to sit down to a delicious lentil stew, grilled chicken and salad at El Sanjuanino. 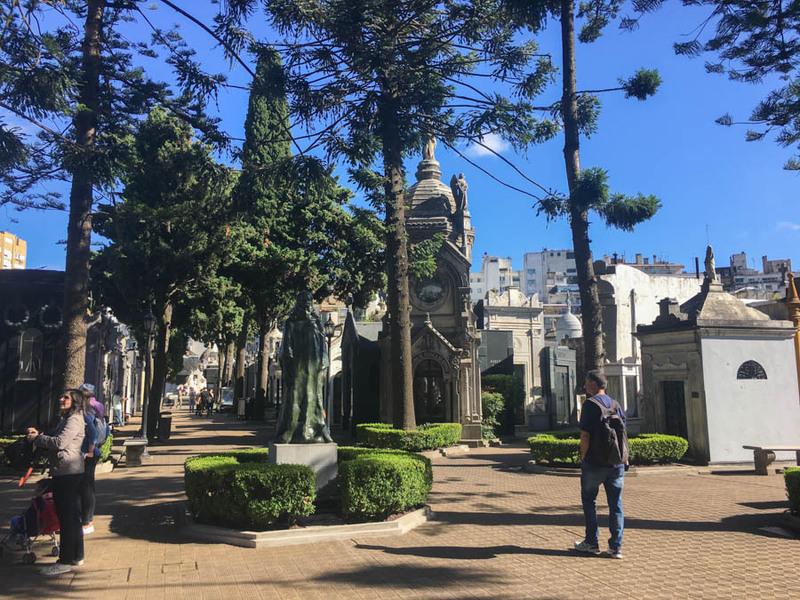 Wandering around the Retiro / Recoleta neighbourhoods, including the cemetery and surrounding parks, we couldn’t help but wonder if our outlook on the city might have been different the first time around had we stayed in this area of Buenos Aires…? 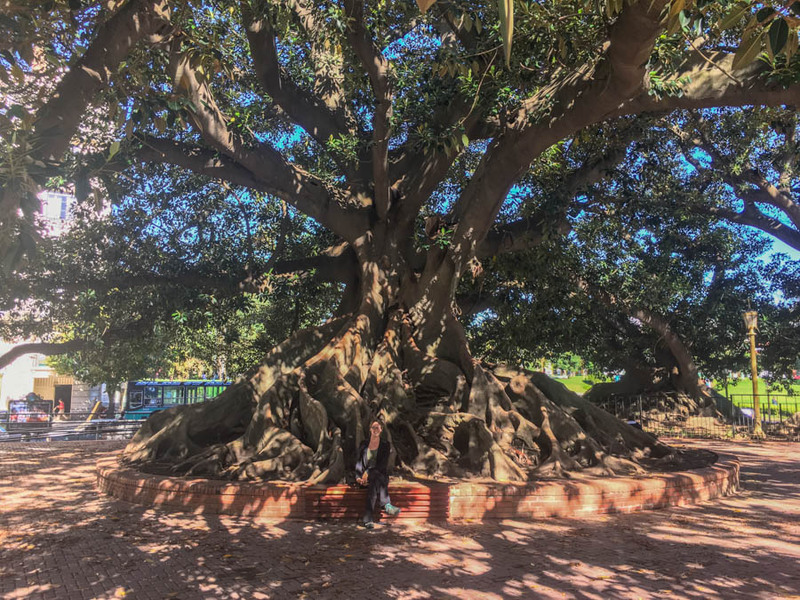 There were still some aspects of the city that got under our skin (so much traffic, noise pollution, smog and the dog poop on the sidewalks), but overall our opinions of Buenos Aires the second time around were much more positive. 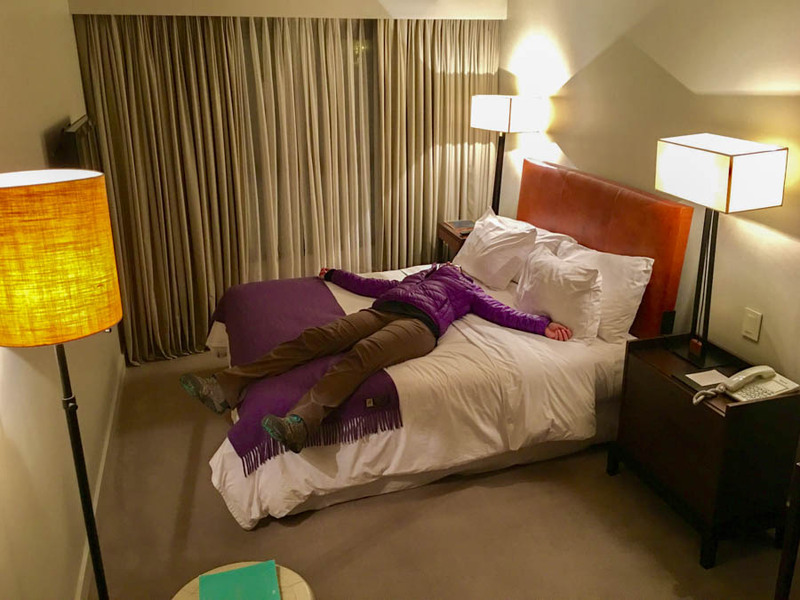 After two nights, we moved on to another hotel – Argenta Tower – which was located just a few minutes away from Serena. We were surrounded by busy little lanes, numerous coffee shops, wine shops and the lovely Plaza San Martín. 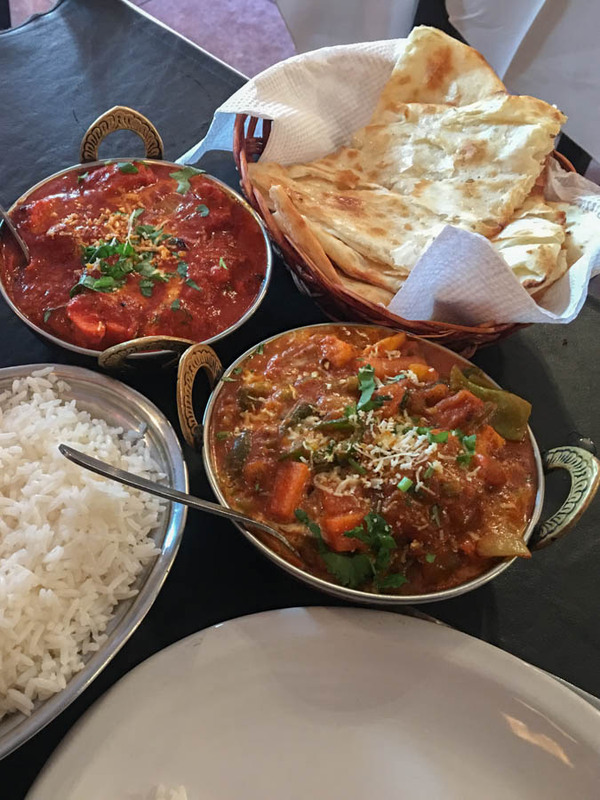 We walked around not really seeing any sites, but just soaking in the atmosphere, while reminiscing on our time spent in Argentina – and stopping off at Delhi Mahal restaurant on 3 occasions to eat some of the most delicious Indian food we’ve had outside of the Subcontinent! Even though this was our second time in the city, we still couldn’t get over just how grand everything was. The plazas and parks were enormous, the buildings were incredibly tall and the traffic spanned 21 lanes in some parts! We had to sprint to make it from one side of the main thoroughfare of Av. 9 de Julio to the other, before the traffic light changed. On our final afternoon in the city, we had a lunch meeting at the Argenta Tower Hotel with Yamila, who is the co-ordinator of press trips in Argentina. 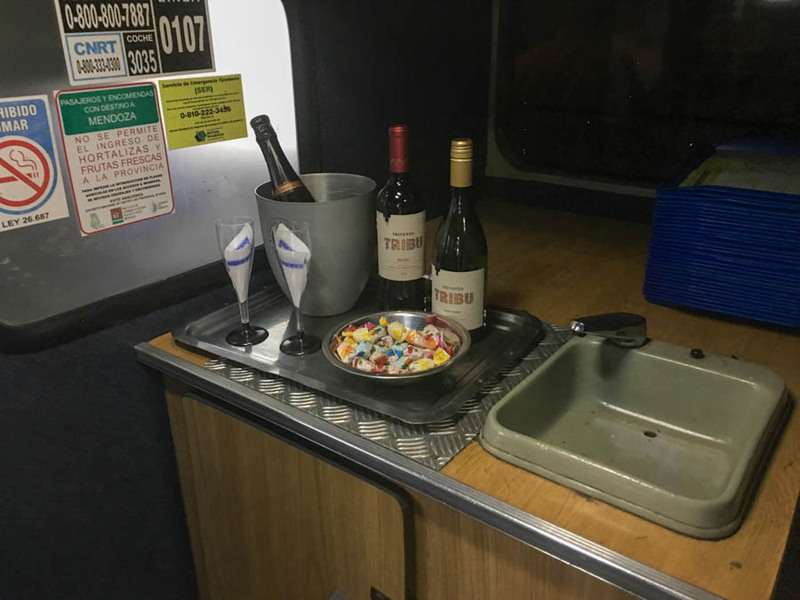 During our time spent in Cafayate, Mendoza, El Chaltén, El Calafate, Bariloche & the Lake District, and these couple of days in Buenos Aires, she set us up with numerous companies and partners. Us with the rockstar Yamila from Destino Argentina. Thanks for putting up with us! Destination marketing is one aspect of our blogging lifestyle that we are very thankful for. If there is a hotel, activity or restaurant that suits our travel style, and the style of our website, then we will partner with them. 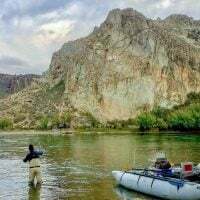 In exchange for sharing our experiences with you (our readers and large, loyal online audience) here on our blog, our social media channels and on our YouTube channel, we receive a complimentary stay, tour, meal, etc. Oftentimes we’ll partner with the tourism board and marketing department of a country, rather than just one hotel / tour company. 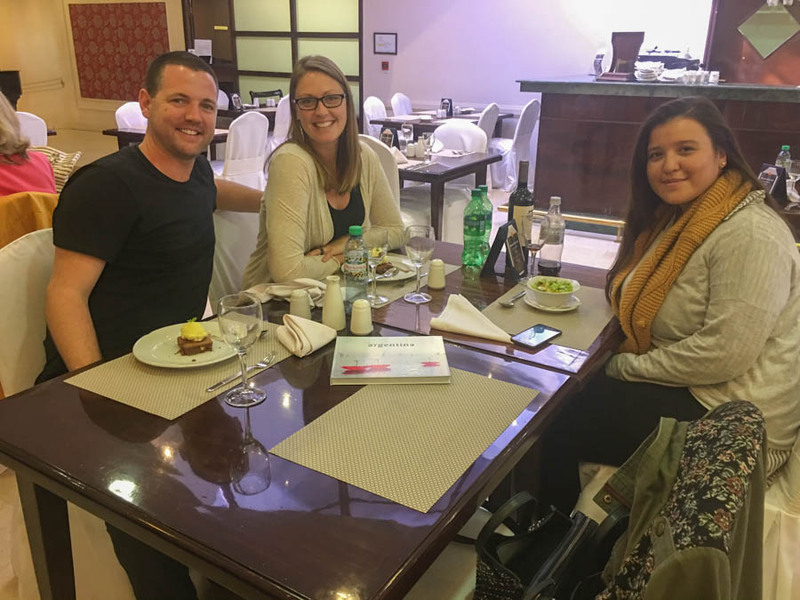 In the case of Yamila and Destino Argentina, it was an unusually long partnership and we’re so grateful to her for all of her assistance and hard work – Nick and I are not the easiest to work with because we are such “last-minute planners”  . After 5 memorable months in South America, it was time to move on and experience other corners of the globe. We were off to Istanbul on our very first Business Class flight with Turkish Airlines! Stay tuned for our round-up of our travels through Colombia, Argentina, Uruguay and Chile. If you’re interested in starting a travel blog, or learning more about how travel bloggers earn money, and receive “free” travel, check out our Travel Blogging section. Or, if you want to learn how to start a travel blog, check out this article for a step-by-step guide. Plus, you’ll get our travel blogging eBook for free! There are three main ways to get from Bariloche to Buenos Aires – by rental car, by bus or by flight (which costs around $300, plus a $50 taxi ride in from the BA airport). The bus takes 26 hours and although our experience wasn’t great, it can be a different bus each day. Ticket prices vary. Ours were 1,670 pesos ($105) each, but because we paid for them in cash at the bus station, we received 500 pesos off each ticket, making it 1,170 pesos ($73) per ticket. Uber is widely used in Buenos Aires, and if you’re out at night, we suggest you take a taxi or an Uber. An Uber ride from the Retiro area to the airport costs around 435 pesos ($27). In the Recoleta / Retiro / Centro area, make sure to eat at Delhi Mahal, El Sanjuanino and Camping Bar. We stayed at Serena Hotel and Argenta Tower Hotel and can recommend both for their quality of rooms, great service and excellent location. Beautiful place and you shared good information about that place. Food is looking so delicious and yummy. collection of photos is so awesome. Awesome blog! I like your post, just awesome pics you shared of the things you enjoyed yummy food. Thanks for sharing it. I liked your post so much! I got very nice information from the bariloche it so interesting blog thanks. Hi guys, sounds like an adventure in BA. Wow, 21 lanes of traffic. I lived in California for most of my life and 14 lanes is a lot there. I can’t imagine 21, crazy. Thanks for sharing you memories and stories. Happy traveling wherever it may lead you.